A blustery morning met us for our last scheduled banding. Once again we were only able to open nets 1, 13 and MXW. The Yellow-rumpeds/Ruby-crowned Kinglet flocks have diminished, although they were still marauding around, in 20s and 30s though compared with the 100s of earlier in the week. As if they knew we were leaving one of these flocks hit MXW on closing round, accounting for 22 of our 32 birds banded! One last hurrah in MXW! There were three Northern Harriers hunting over the field as I set off on census, including two adult males. Down on the lagoon there was a good diversity of waterfowl with Mallards, American Wigeon, Northern Shoveler, Ring-necked Duck and Common Merganser present. As we only had 3 nets open, between net checks we starting taking down the rest of the nets and had the station more or less packed up and ready to leave until next year by the time we were due to close. Ever the optimists, we left the owl nets up in case we could get a final night of owling in tonight…not surprisingly, as I write this there is a full on deluge coming down outside. Oh well. As this will probably be our last blog post for the year I will give a brief overview of the season and how the birds caught compared with previous seasons. 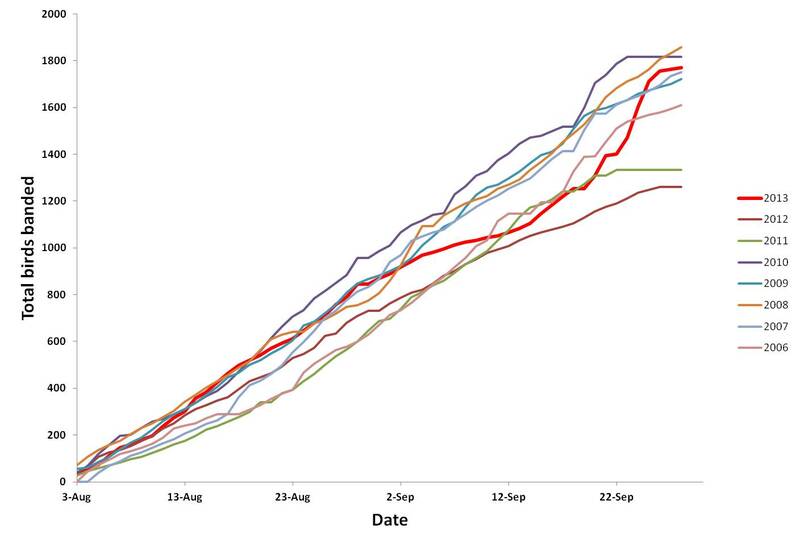 The fairly slow start to the season pointed towards a mediocre breeding year in the immediate area, however once migration got into full swing, around mid-August, we saw a significant push of birds until the end of the month. The first two weeks of September were non-interrupted clear skies and high temperatures which generally mean that birds spend more time in active migration and less time refueling. As expected this translated into a very slow third quarter of the season. 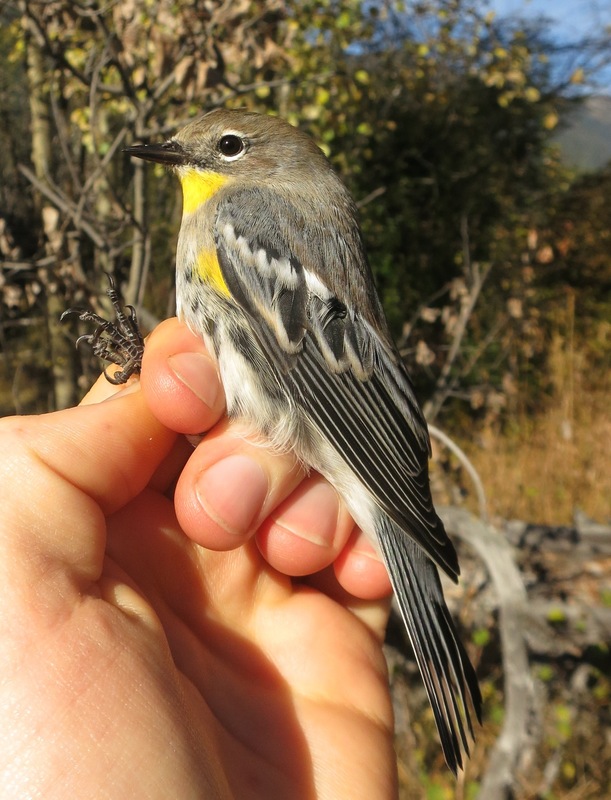 However, once the weather changed and the later migrants, in particular Orange-crowned and Yellow-rumped Warblers and Ruby-crowned Kinglets started arriving we proceeded to have the busiest period in TLBO history. Indeed between Sept. 20 and 25 we caught 555 birds (one of those days we only banded 13 as we could only open two nets for a total of 9 net hours), 461 of which were standard! Overall we saw large numbers of non-aerial insectivores this year. Most warblers were either at or above average. Warbling Vireos and both Ruby-crowned and Golden-crowned Kinglets were way above average as well. On the lower than average side were the Sparrows. Lincoln’s and Song Sparrows are often our two top catches and both were very low this year. We banded 87 Song Sparrows (64% of our average annual catch) and, even more concerning, Lincoln’s Sparrows totaled just 78 banded (34% of our average annual catch). As always a huge thank you to all our readers and we look forward to blogging for you in 10 months time. Have a good year! The wind kicking up some nice waves down at the lake. The howling wind quickly returned us to our beds this morning. When we got up for census it seemed to be calming so I stayed behind to run our 3 windy day nets: 1, 13 and MXW. Unfortunately the winds started gusting over 40 km/h so we had to abandon our efforts by noon, with only 10 birds banded. Census was similarly slow also due to the wind. The Yellow-rumped Warbler and Kinglet numbers significantly decreased as most were likely tucked away from the wind. This afternoon we continued getting ready to close up the station. The past two afternoons have been spent trimming trees by nets 12 and 17 in hopes of encouraging new growth for next year. The pruning we did earlier in the season did help stop the birds flying up over the nets through the tree tops, but the remaining lower portions of the willows were fairly spindly. We hope that by cutting low enough the new growth won’t overshoot the tops of the nets until the end of next season. We’ve also been busy getting the data in order to be sent off to the Canadian Migration Monitoring Network. 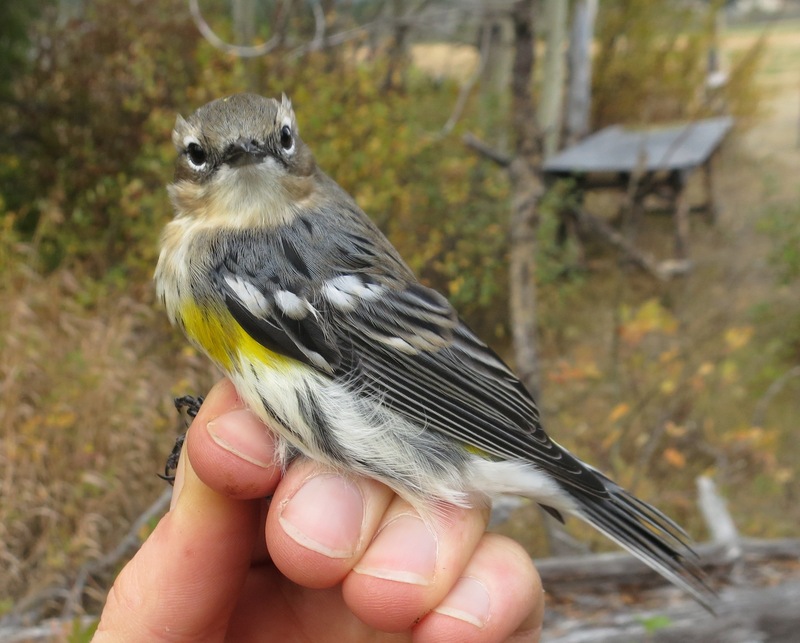 Data from all banding stations across North America are compiled into a massive database that provides baseline information needed for bird conservation. This data can be accessed and used to provide accurate information of population status and changes. This is particularly important for birds breeding in remote boreal areas that are not easily surveyed on breeding grounds. See their website for more information: http://www.bsc-eoc.org/volunteer/cmmn/index.jsp?lang=EN&targetpg=index. Today was back to something resembling normalcy. No doubt the clear cold night encouraged the birds to move south. Interestingly, despite near perfect conditions for owling last night we failed to catch any. The night before, with mediocre conditions produced 3! I guess you never can tell. Unfortunately, with the forecast for deteriorating weather starting tonight it is unlikely that we will get in any more owling this season, leaving us with a disappointing total of 7 banded. Fingers crossed though for at least one more night of good conditions. There were still reasonable numbers of birds about and we did catch a few little flocks of kinglets, juncos and Yellow-rumpeds. We are starting to see more after-hatch-years, especially in the latter, and we caught two particularly striking males. Hermit Thrushes seem to be increasing and we caught a season high 3 and heard a few others as well. AHY male “Audubon’s'” Yellow-rumped Warbler. Census was unexciting until the last quarter hour. As I neared the lagoon I could hear a familiar call, wayyyyy overhead. Looking up I could just make out a flock of 30 Snow Geese making there way south. They passed just over the waning moon creating a quintessential image of bird migration in my binocular view! This is the first record for the station but no doubt they migrate over us every year as they head to their wintering grounds on the Fraser Delta or points further south. Down by the lagoon there were a few sparrows about with a Golden-crowned and two White-throateds foraging in the underbrush. They were briefly joined by a Pacific Wren. We had a two more species that were new for the season. Neither are particularly rare, indeed they are downright common through much of BC, but we don’t seem to record them much in the valley. As I was making my way back to the station from the the lake after census I spotted a Killdeer on the mud flat at the back of the lagoon. Back at the station there was at least one, and probably a second Mourning Dove in the field that we flushed a couple times. Fresh snow…can you take too many pictures of the Niuts? A possible celata Orange-crowned Warbler. Another big day shot us forward into the 2000s. Today 100% of our birds were standard, putting us up to 1713 standard birds. 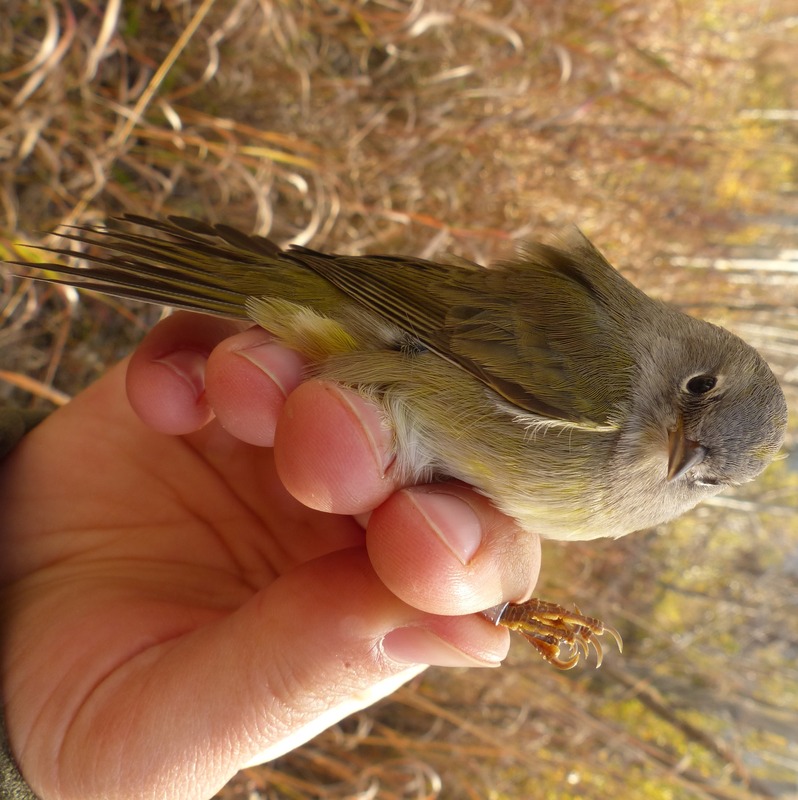 The majority of birds banded were still Ruby-crowned Kinglets, though the mix was much more even today. We banded21 Orange-crowned Warblers presenting us with a really nice mix of ages and sexes of both of our common subspecies: the brighter yellow lutescens and the grey-headed orestera. Both Avery and I have noticed a few very pale Orange-crowned Warblers in the mix, with almost no yellow on the belly/undertail coverts, that we suspect might be the more northern breeding (and furthest south migrating!) celata subspecies. This pale Orange-crowned Warbler has a greenish wash on it’s belly and little contrast between rump and back, traits of the more northern breeding celata subspecies. One group of species that has been noticeably absent finally appeared: our sparrows! During census today I saw a group of 8 Song Sparrows and a Lincoln’s Sparrow hanging out together, the first decent Song Sparrow group I’ve seen all season! 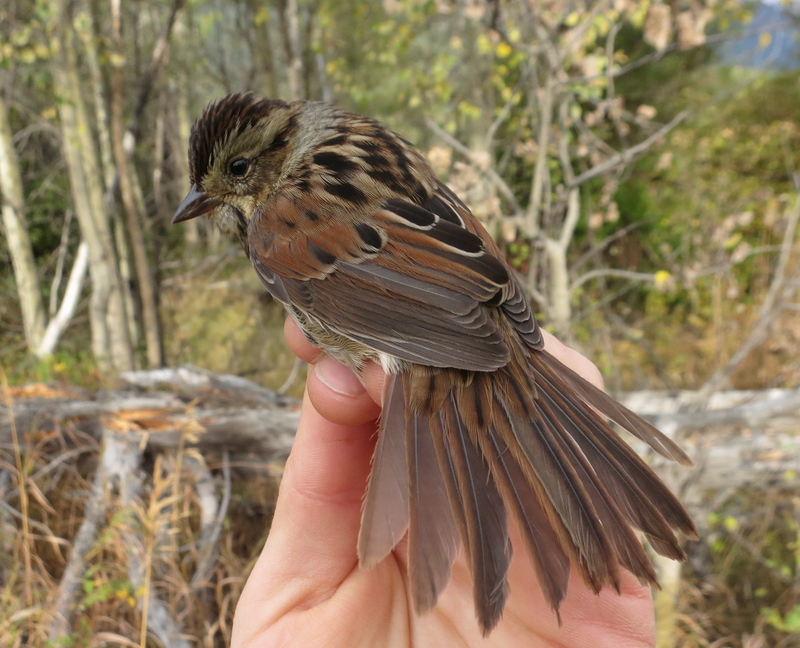 Our catch numbers are also up, with numbers of Lincoln’s Sparrows, White-crowned Sparrows and Oregon Juncos being more comparable to what we’d expect from previous years. Besides for sparrows on census, I also had a nice encounter with a pair of feisty Pacific Wrens. Also notable was a Mountain Bluebird flyby. 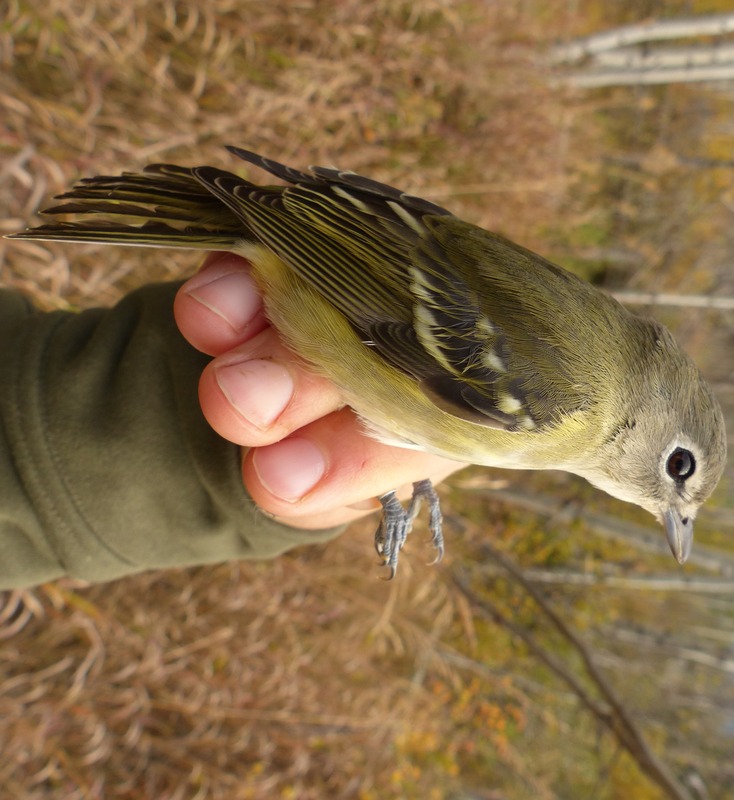 Our second Cassin’s Vireo this season! Around the station we had a few rarities. After I got back from census Avery extracted our second Cassin’s Vireo this year! We both heard a Blue Jay calling the round before closing. Avery was lucky enough to see it perched in a snag about net 13. Unfortunately by the time I arrived with my camera it had disappeared. Sept. 24: 136 BIRDS….What now?!! …Banded. Yes, that’s right, 136 birds banded. Only 4 of which were non-standard which means that, thanks to a Kinglet invasion, we smashed the previous record! It was the perfect type of busy day as well; steady, with typically 10 – 15 birds per net round so we never got behind in the lab. This was particularly important while I was away on census as we no longer have any volunteers to assist us. When finally we did get a big net round (~40 birds) it was on closing round so both of us were there to extract and ensure that everything went smoothly, and we were able to band them without the pressure of one of us having to leave to check the nets. 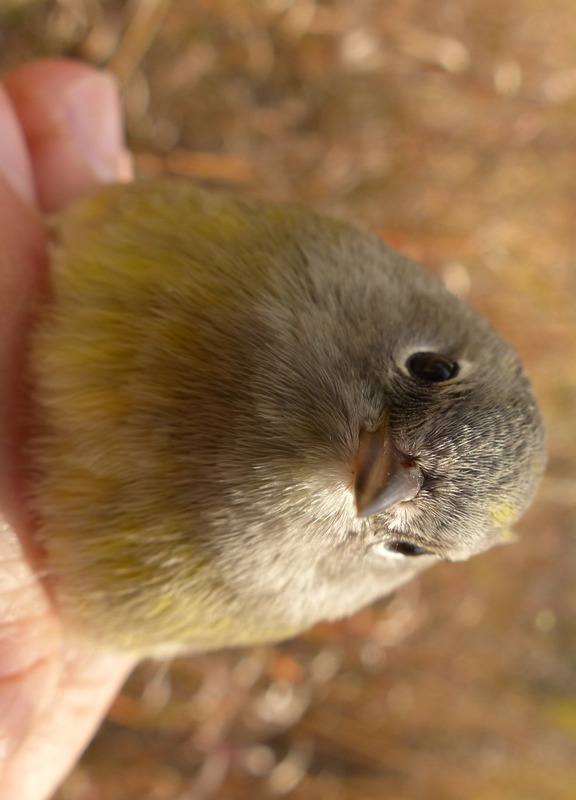 The bulk of the day’s catch were Ruby-crowned Kinglets, with 80 banded. As far as I know this is by far the most of any one species that we have ever caught in one day here at TLBO. Despite there still being good numbers of Yellow-rumped Warblers around we only caught 12, and similar numbers of Orange-crowned Warblers. Among the regulars, Morgan pulled two new species for the season out of the nets. 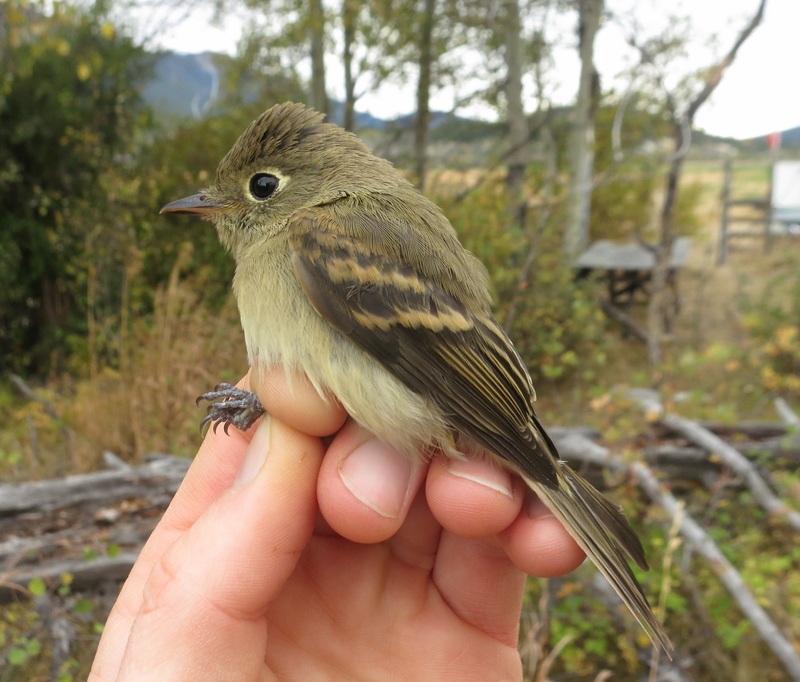 A very late Pacific-slope Flycatcher and our 4th ever banded Swamp Sparrow! While certainly being the more common of the two, this late in the season I am almost more surprised about the flycatcher than the sparrow. Swamp Sparrow, 4th banding record. 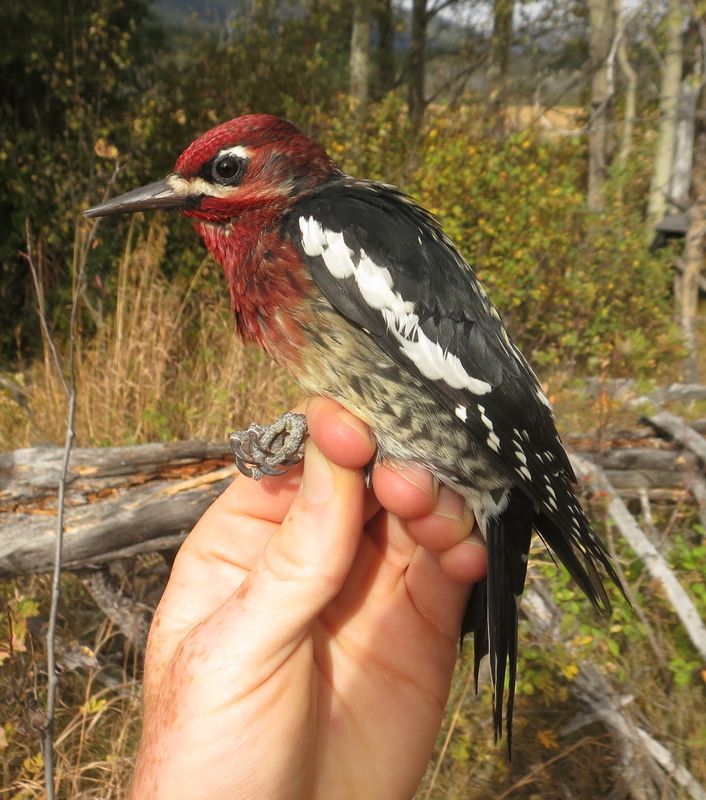 To top things off, when I arrived back from census, Morgan had just pulled a hybrid Red-breasted x Red-naped Sapsucker out the net 12! 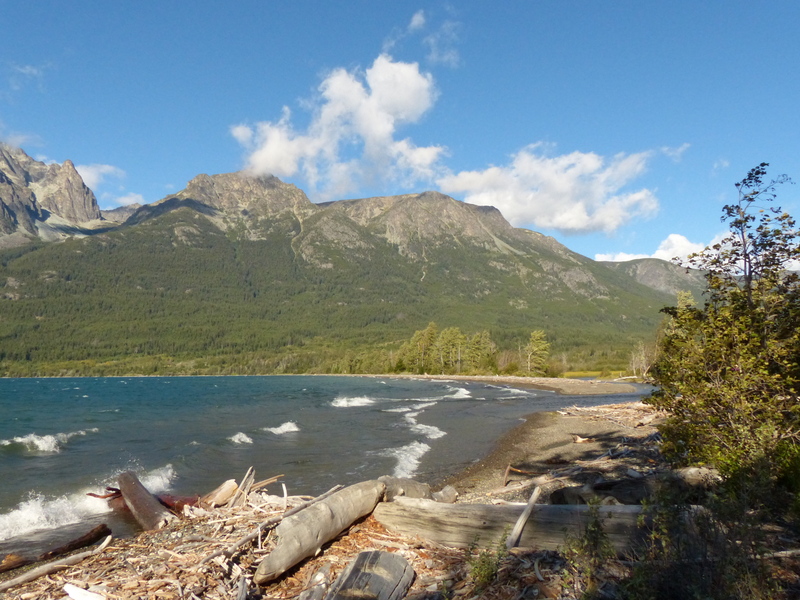 The contact zone for these two species is about 100km north of here, around Anahim Lake. There, hybrids are almost more common than purebreds, and we do typically see a couple hybrids per year here. There were a lot of birds around on census with a big flock of Dark-eyed Juncos and a few mixed species flocks seen. Nothing out of the ordinary was recorded, although an Osprey over the lagoon was a bit late in the season. A couple Golden-crowned Sparrows and both Dusky and Hammond’s Flycatcher were also notable. Visible migration was quite evident with small groups of American Robins joining the flocks of Yellow-rumped Warblers passing over. American Pipits were heard overhead most the morning and we estimated 32 in the census area, although we undoubtedly missed a lot more. To cap the day off, as I was banding the last couple birds we heard a Mountain Bluebird, a species that has been notably absent this year. 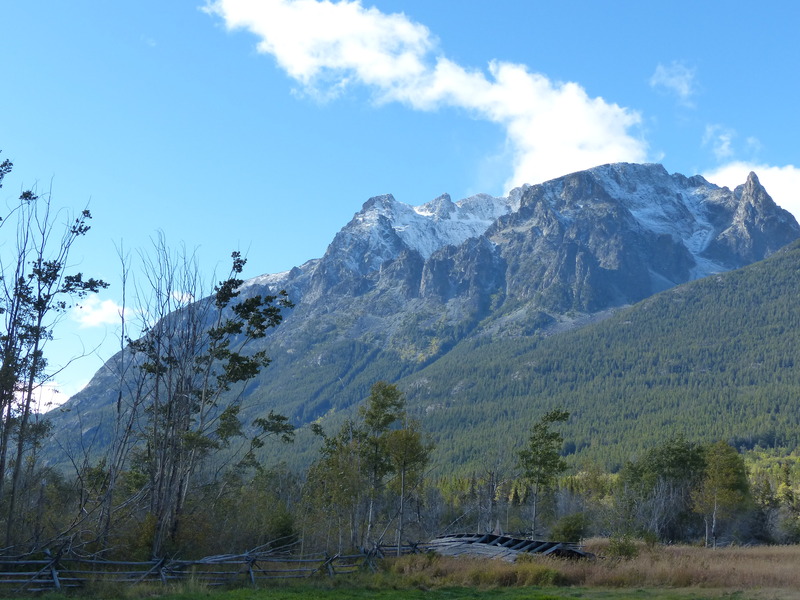 A fresh dusting of snow on the mountains. We started out this morning saying a fond farewell to Cathy, who left us after a 3-week stint up here. 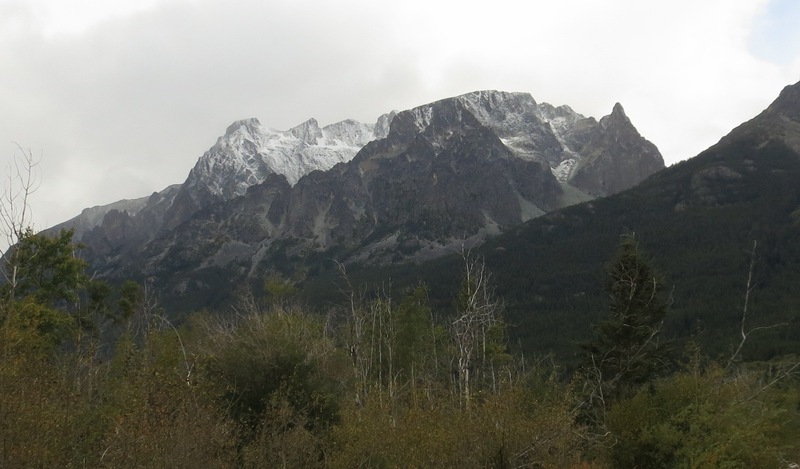 We left the house into drizzly weather, but as we drove down to the station the clouds started to lift and we could see a fresh layer of snow on the mountaintops circling the station. We opened up the closest nets before we were confident the rain had ended and had the whole show up and running by 7:30. Lots of birds were out despite the weather, including our first Varied Thrushes of the year. 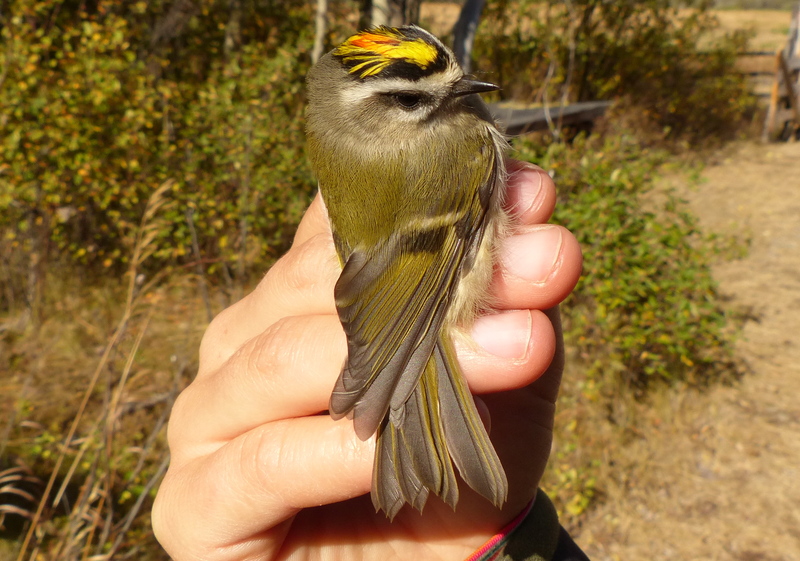 Numbers of Golden-crowned Kinglets certainly picked up, and we had our first big catch of them this season. Those weren’t the only little dudes we had good numbers of — we also caught 30 Ruby-crowned Kinglets (today’s most banded bird) and the usual high numbers of Yellow-rumped Warblers and Orange-crowned Warblers. After a 60 bird net round right before Avery left on census we had to close the nets to give me a chance to catch up in the banding lab! One of many Golden-crowned Kinglets. Shortly after leaving for census, the winds picked up substantially making birding difficult. Census was fairly slow with only a few small flocks along the way. Avery was lucky enough to spot our first Coyote of the season trotting along the path ahead of him. The winds kept up for the rest of the morning so we were only able to open nets 1, 13, and our sheltered MX net near the station for the rest of banding. We still managed to catch a few small flocks in each of 13 and MXW. 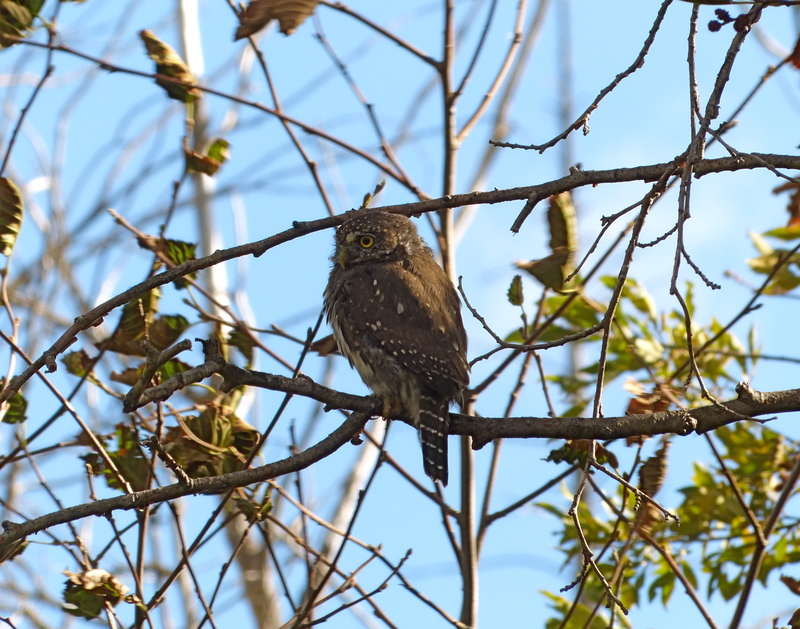 As we were closing Avery spotted some warblers mobbing a Northern Pygmy-owl 10 m from net 13! It stuck around guarding a Song Sparrow it had managed to catch for itself, giving us great looks. It was the highlight of the day for both of us! It was a shame that we woke up to high winds this morning, as when we arrived to the station for census it was evident that there were still loads of birds about. 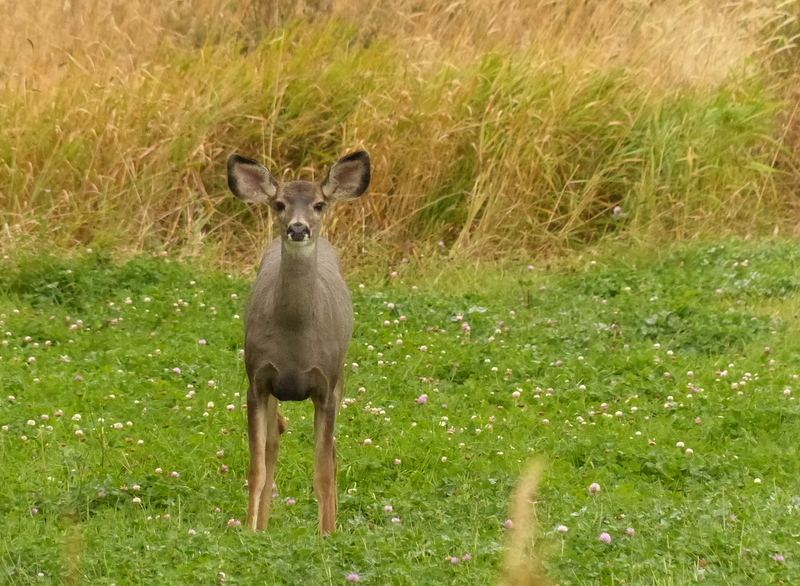 As we pulled in to the parking area we were welcomed by the usual entourage of deer. One member of our welcoming committee. Before I set off on census we moved one of the non-standard nets to a more sheltered location within view of the lab and opened our two closest standard nets. With Morgan and Cathy keeping a close watch on these three nets we were able to at least catch a few birds. While I was off on census they caught our 7th Hermit Thrush of the season along with a couple Orange-crowned and Yellow-rumped Warblers. In total we managed to band 13 birds in our four hours banding, 7 of which were standard. 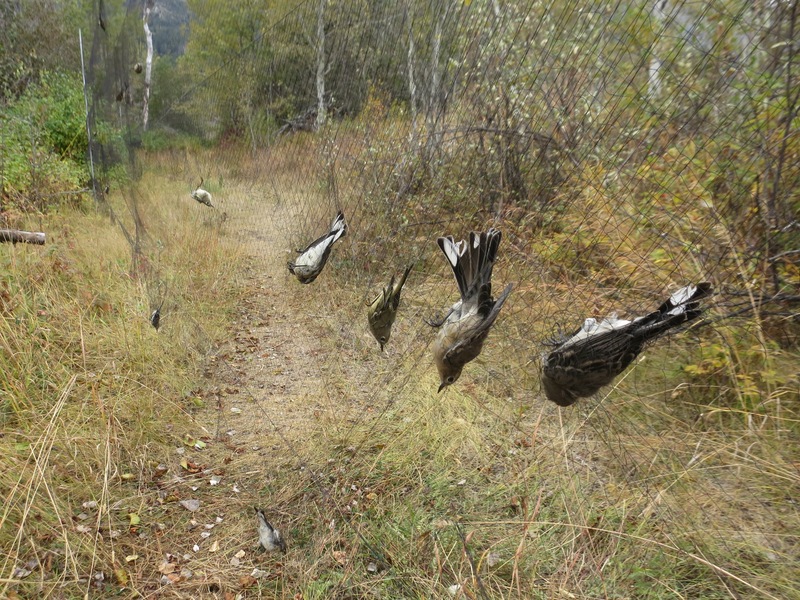 These seven were significant though as it pushed us over 1,400 standard birds banded for the season. On census I ran into a few large flocks of Yellow-rumpeds that included a nice male Yellow Warbler (Morgan had another Yellow Warbler around the lab). A few ducks were on the lagoon despite the rough waters, these included Mallards, a pair of American Wigeons, Ring-necked Ducks and Wood Duck.